WashingtonExec’s STEM Executive series spotlights local government and private sector executives and their insights about the shortage in STEM workers/local pipeline gap. We’ll publish the stories periodically throughout “SeptSTEMber” in Q&A or feature format. The greater Washington area employs the largest percentage of STEM workers (18.8 percent in Maryland and 16.5 in Virginia, according to a U.S. Census report), suggesting the area depends heavily on STEM competence for its continued sustainability. And while industry and government execs are eager to hire STEM graduates, the number of U.S. high school seniors who are both proficient and interested in STEM lies at a meager 16 percent. 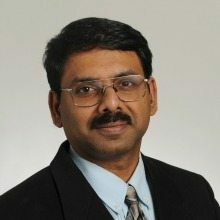 WashingtonExec interviewed Dr. Padhu Seshaiyer, Professor of Mathematical Sciences, Director of STEM Accelerator Program and Director of the COMPLETE Center at George Mason University (GMU). WashingtonExec: When did you become interested in STEM issues? Dr. Padhu Seshaiyer: I came to the United States about 20 years back as a graduate student and had received my formal K-12 and undergraduate training in India prior to coming here. One of the subjects that constantly excited and puzzled me at the same time throughout my K-12 career and then undergraduate studies was mathematics. It was exciting because of the satisfaction that I always got by solving problems and obtaining that single answer which matched with the back of the book. It was puzzling because every time I used a formula to solve a problem in mathematics, I always wondered and asked myself “When am I ever going to use this (in real life)?” I did spend a lot of effort during my K-12 days and undergraduate training (both of which were taught in a very traditional and more theoretical approach), trying to find answers to this question. In doing so, I started to pick up ideas from other disciplines such as computer science or biology or engineering where the answers to my question was hiding. But I realized that it was both my passion for mathematics and the need to motivate myself to learn about its applications to the real-world is what prompted me to realize this interdisciplinary field of STEM. Ever since this realization, I have been a strong proponent of STEM across the curriculum. The issue in the United States is not just in providing the motivation to students, but also that the people who are expected to motivate the next generation workforce (including teachers, academicians, industrialists, government etc.) are not often trained to do so. WashingtonExec: What do you see as the underlying root of this problem? Dr. Padhu Seshaiyer: There are several factors one may attribute the lack of passion to pursue a career in STEM. I feel the underlying root of the problem is our educational system. While the United States offers a world-class education, it still lags behind several countries in preparing the next generation workforce in STEM that are creative problem solvers, good critical thinkers, good communicators and good collaborators. The Ministry of Education in Singapore which is one of the top countries when it comes to education promotes the concept of “Teach Less Learn More.” Finland, another country that performs significantly high in the education scale, promotes the concept of “Learning by Doing.” Whether they use the word STEM or not, these countries have already thought about their curriculum carefully to incorporate STEM based activities that engage the students constantly and ignite their learning. In these countries, systemic changes led to improved teaching and learning over the last several decades. While the United States has intensified standardized testing and accountability since the 1990s, these countries have been developing a collaborative, trust-based, professional model. The issue in the United States is not just in providing the motivation to students, but also that the people who are expected to motivate the next generation workforce (including teachers, academicians, industrialists, government etc.) are not often trained to do so. Everyone is a specialist in their own areas, and it is often hard for them to come out of their comfort zone to become a generalist. WashingtonExec: How and where should policymakers be focusing their resources and efforts to augment the pipeline and address the underlying problem? Dr. Padhu Seshaiyer: It is time to bring about a change in the ways we educate the next generation which currently has mostly been geared towards the philosophy, “Here is the mathematics (or STEM), go solve the problem.” Instead, the philosophy I would like everyone to preach is “Here is the problem, let us find the mathematics (or STEM) to solve it.” In fact, what is important in a workplace is not always how smart someone is with formulas and rules, but how useful someone is when making important decisions. So it is essential for policy makers to understand the importance of incorporating life-long twenty-first century skills in the curriculum including communication, collaboration, critical thinking and creativity in all subjects. Yes, it is great to do one-stop summer camps on STEM or create grant funding opportunities that responds to President Obama’s call on STEM in a timely fashion etc., but if there is no thought process on long term sustainability to continue and support these, then the efforts are often wasted. So it is important to not only identify and implement effective pedagogical and experiential learning approaches for improving STEM teaching and learning, but also continue to support key players and projects that help facilitate the dissemination and adoption of effective STEM instructional practices across the country. Such efforts will help to promote STEM education experiences that incorporates hands-on learning to impact student engagement, interest and achievement in the STEM fields in a positive way. The STEM Accelerator Program that I direct at George Mason University is such a program with a mission to recruit and retain the next generation STEM workforce along with helping with on-time graduation and guiding students to pursue STEM jobs and careers. We run programs at all levels including STEM Mania (a summer camp for grades 3-5 students), FOCUS (Females of Color underrepresented in STEM for middle school girls), High School Mentored Research (through partnership with school districts), STEM Boot camp (a pre-interventional program to get them ready for four-years of college in STEM), Undergraduate Learning Assistants Program (that offers peer-to-peer mentoring opportunities both within the university as well as partnering community colleges), Research Experience for undergraduate, graduate and Post-Doctoral students (through experiential learning), Discipline Based Education Research (a platform for sharing best teaching practices between faculty), STEM Teacher Professional Development Programs (for taking effective pedagogical practices back to their classrooms) and many more! Yes, we constantly scramble (like everyone else) to find funding to support these programs annually. But, it is the passion of a dedicated group of faculty members that has helped to sustain these continuously. WashingtonExec: What challenges do you see currently impeding the path to implementing that solution and making STEM reform a priority in the U.S.? Dr. Padhu Seshaiyer: Coordination and Collaboration! Everybody sees the need and recognizes it, but there is hardly any coordinated efforts to create something together that is successful and sustainable. Most of the STEM programs are one-stop shops, and there is often no continued support in sustaining some of the best programs that are trying to produce results. Often this is due to the need for internal or external funding which leads to competition between multiple successful programs and in an effort to sustain their individual programs, each of them tend to work in an isolated fashion in competition and not collaborate with other similar successful programs. The Common Core State Standards is an example of this. Not all 50 states joined into one common national idea. There are states that did not adopt it at all, there are states that only adopted it for specific subjects, there are states that adopted it for some time and are now pulling out of it as they feel their original state standards were much better and the impact was more clearer than the Common Core. So my point here is not to necessarily support or not support the Common Core, but simply that when a coordinated effort such as this is made across the country (by a handful of people! ), it is important to respect concern of and take input from citizens, parents and educators, as well as legislators before administering such national policies and not after the fact! In 2010, the Partnership for Assessment of Readiness for College and Careers (PARCC) had 23 states plus the District of Columbia, but now there are no more 14 states plus the D.C. school system. There were once 31 states in the Smarter Balanced Assessment consortium, but now there are 22 states plus the U.S. Virgin Islands. My concern, therefore, for implementing a common solution and making STEM reform a priority in the U.S. is similar. Often such decisions are made by a select group of individuals and policy makers often without any proper coordination with all possible stakeholders and policies get implemented without proper assessment and evaluation strategies and protocols. To give you an example, most universities don’t keep a good track of why many students starting in STEM and are leaving STEM, how many students transferring to a university from community colleges with an intent to pursue STEM actually continue to graduate in STEM, effective rubrics to evaluate which STEM programs are working and which are not etc. I also do not want to argue that standardized assessments for students are good or bad. The issue is how these assessments are used for informational purposes in a trusting collaborative environment to reinforce concepts that can help promote the passion for STEM for many students. WashingtonExec: Why do you care? This feedback is from one undergraduate student who worked under my guidance through a Research Experiences for Undergraduates (REU) program funded by the National Science Foundation (NSF) that I directed at George Mason University (GMU) . This comment came from another student who worked on another STEM project with me, as well. All these comments are great illustrations of the impact of exposing students and teachers to real-world STEM applications. Such interdisciplinary STEM training programs not only help develop innovative methods to explain fundamental mechanisms needed to understand quantitative and qualitative behavior underlying scientific and engineering applications but they also can help students to become change agents for transforming practice in teaching, research and education. This is why I care!